Focusing en Comunidad: Como Empezar Un Grupo De Apoyo De Escucha Y Focusing (184 pp.) by Dr. Kathy McGuire, Creative Edge Focusing (TM) . Trans. 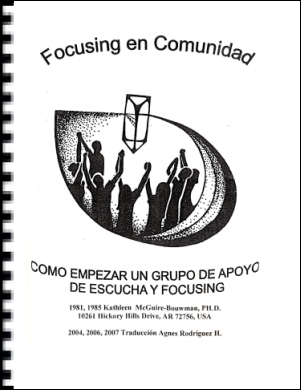 by Agnes Rodriguez Complete instructions for starting a Focusing Partnership and a Focusing/Listening Practice Group (a Changes group) with Chapters on Finding Your Core Group, Focusing, Lstening/Focusing Exchange, Interpersonal Focusing, Collaborative Decision Making. Dr. McGuire has 30 years experience teaching Listening/Focusing Partnership skills and leading Changes groups. 1981, revised 2007. We are offering this book as a free download, but we encourage you to make a donation to the Focusing Institute. This book was previously sold in the Institute's store for $25.